All content included on this site, such as text, graphics, logos, button icons, images, video clips, and software, is the property of Babypool.com, and is protected by U.S. and international copyright laws. The compilation (meaning the collection, arrangement, and assembly) of all content on this site is the exclusive property of Babypool.com, and is protected by U.S. and international copyright laws. All software used on this site, including all HTML code, is the property of Babypool.com, and is protected by U.S. and international copyright laws. You acknowledge and agree that these rights belong to their respective owners and are protected in all forms, media and technologies existing now or hereinafter developed. Babypool.com, grants permission to access and view the Babypool.com site, send on-line invitations and announcements and to electronically copy and print in hard copy invitations and/or announcements that have been purchased for the sole purpose of sending the purchased invitation and/or announcement to guests that can't receive emails. Any other use of the Babypool.com site or the Content without permission of the applicable rights holder is strictly prohibited, including without limitation and modification, republication, deletion, transmission, public performance, distribution, proxy caching, uploading, posting, reproduction for purposes other than those noted above, or other exploitation of this site or the Content, in whole or other than those noted above, or other exploitation of this site or the Content, in whole or in part. Without limiting the foregoing, the unauthorized use of the Content is illegal and could subject you to criminal prosecution a well as personal liability for damages in a civil suit. Your use of the Babypool.com site is subject to applicable local, state, federal and International law. You may not use this site for any unlawful purpose, and you may not use this site to send invitations or announcements for chain letters, commercial solicitation, mass mailings, or any form of "spam." You are solely responsible for the content of your messages sent using this site, and you may not use this site to send messages that are illegal, obscene, threatening, abusive, offensive, profane, or defamatory or that infringe upon the rights of third parties. You may not use false e-mail addresses or otherwise mislead card recipients as to the origin of a card sent using this site. You agree to indemnify and hold Babypool.com, harmless from all claims resulting from your use of this site, including any claims related to the content of any messages sent using this site. Babypool.com is pleased to receive feedback from our customers and welcomes your comments regarding BabyPool's services and content. If you send us creative suggestions, ideas, notes, drawings, concepts, or other information (collectively, the "Submissions"), the Submissions shall be deemed, and shall remain, the property of Babypool.com. None of the Submissions shall be subject to any obligation of confidence on the part of Babypool.com, and Babypool.com shall not be liable for any use or disclosure of any Submissions. Without limitation of the foregoing, Babypool.com shall exclusively own all now known or hereafter existing rights to the Submissions of every kind and nature throughout the universe and shall be entitled to unrestricted use of the Submissions for any purpose whatsoever, commercial or otherwise, without compensation to the provider of the Submissions. APPLICABLE LAW. 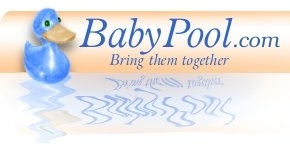 The Babypool.com site (excluding linked sites) is controlled by Babypool.com, from its offices within the State of California, United States of America. Since it can be accessed from all 50 states, as well as from other countries around the world, and each of these places has laws that may differ from those of California, by accessing the Babypool.com site both you and Babypool.com, agree that the statutes and laws of the state of California, without regard to the conflicts of laws principles thereof, will apply to all matters relating to use of the site and its contents. You and Babypool.com, further agree to submit to the exclusive personal jurisdiction and venue of the Superior Court of San Francisco County and the United States District Court for the Northern District of California with respect to any matters relating to use of the site and its contents, or any transactions arising from such use. SPECIAL LEGAL CONSIDERATIONS. You must possess the legal right and ability to use the Babypool.com site. Without limiting the foregoing, you agree to be financially responsible for any purchase(S) you place on or in connection with the Babypool.com site and/or the Content may not be suitable for all visitors. You agree to comply with all applicable laws, rules and regulations concerning your access to and/or use of such portion(s) of the Babypool.com and/or the Content, including any internal rules regarding your access to and/or use of the site (e.g. any applicable rules and or policies of your employer or Internet Service Provider). Not withstanding any other provision of these terms to the contrary, Babypool.com, reserves the right to cooperate with local, state and federal officials in any investigation relating to any purported illegal activity(ies) and, when required by law, regulation, legal process or government requests, to disclose any personal information furnished by you or collected by Babypool.com, to law enforcement authorities or other third parties.